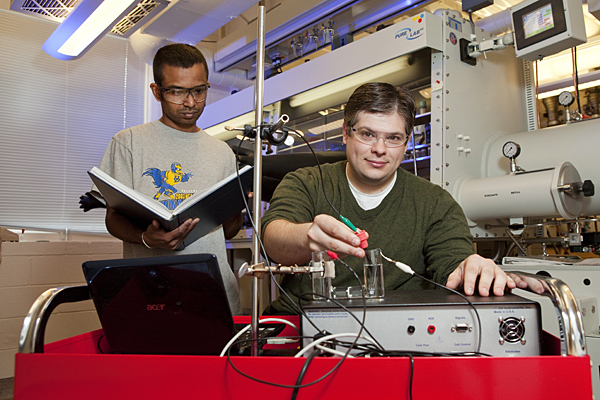 UD chemist Joel Rosenthal (seated) and postdoctoral researcher Piyal Ariyananda work in Rosenthal's lab in the UD Department of Chemistry and Biochemistry. 1:04 p.m., April 26, 2011--Pulling valuable fuels out of thin air? It sounds like magic, but Joel Rosenthal, a chemist at the University of Delaware, is working to transform carbon dioxide (CO2), a greenhouse gas in the atmosphere, into gas for your car and clean-energy future fuels. Such a feat could help reduce the rising CO2 levels implicated in global warming and also offer a new method of renewable energy production. Oak Ridge Associated Universities (ORAU), a consortium of 98 Ph.D.-granting universities, of which UD is a member, has selected Rosenthal to receive the Ralph E. Powe Junior Faculty Enhancement Award to pursue the novel research. Rosenthal is one of 30 award winners nationwide. The competitive award, which provides $5,000 in seed funding from ORAU and $5,000 in matching funding from the faculty member's university, is intended to enrich the research and educational growth of young faculty and serve as a springboard to new funding opportunities. Rosenthal and his team are designing electrocatalysts from metals such as nickel and palladium that will freely give away electrons when they react with carbon dioxide, thus chemically reducing this greenhouse gas into energy-rich carbon monoxide or methanol. Besides its use in making plastics, solvents, carpet and other products, methanol fuels race cars in the United States and currently is being researched as a hydrogen carrier for fuel cell vehicles. Carbon monoxide is an important precursor to liquid hydrocarbons in the energy arena, in addition to its applications as an industrial chemical for producing plastics to detergents to the acetic acid used in food preservation, drug manufacturing and other fields. “The catalytic reduction of carbon dioxide to carbon monoxide is an important transformation that would allow for the mitigation of atmospheric CO2 levels, while producing an energy-rich substrate that forms a basis for fuels production,” Rosenthal says. As early as junior high, Rosenthal said, he realized that basic life processes are linked to molecular energy conversion. Then his undergraduate and graduate research took off on renewables. He earned his undergraduate degree in organic chemistry from New York University and his doctorate in inorganic chemistry at MIT while studying how metals catalyze various energy conversion processes. His doctoral adviser at MIT was Dan Nocera, a leading scientist in renewable energy research. The strong reputation of the chemistry and biochemistry department lured Rosenthal, a New York City native, to UD. He joined the UD faculty this past fall and already has a research group of eight focusing on the project  one postdoctoral researcher, four graduate students and three undergraduates. Conservative estimates predict that by 2050, the rate of global energy consumption will roughly double the rate recorded at the end of the 20th century. Most scientists believe that rising carbon dioxide levels are leading to global climate change.